Source: Dr. Andy Roark Dog, see? Cycling. I was born with either blessed or cursed genetics, depending on your view of puns. Both of my parents have a talent for punning, or maybe it’s a disease. Either way, they passed it on to me. I discovered this one day on the playground during a break from school while running around wearing denim pants. My biology teacher came up to me and said he had looked at my chromosomes and discovered that my jeans were recessive. Get it? See, that’s funny because of the words genes and recess and inherited traits that…. Oh, nevermind. Puns are also in the DNA and maybe also the water of Austin, Texas. It’s the home of the O’Henry Pun-Off, an annual contest for Punniest of Show and Punslingers. William Sidney Porter aka O’Henry, the author well-known for short stories lived here for a time. The eponymous event is sponsored by a small museum that he lived in that’s downtown during the 1890’s. I’ve attended the last four or five years, missing one, but have never competed and don’t plan to. Although I’d love to be a stand-up comic, I’m far too tired to not sit down. Plus, I’m a writer after all, and far too slow with quippy comebacks. But I do appreciate the talents of those who are quick with a joke that involves a play on words. Without further ado, here are a few original puns I’ve spent the last two hours working on! Sometimes, I am amazed that with all the bike rides I’ve done, that I’ve only fallen off a few times. I am frequently reminded of this because I have a pet female duck who really enjoys being petted, but not on her back or belly. And the fur that comes off I save and put into pillows. I like to keep the rub-her side down. I once knew a bike rider from Germany, from 1982-98. He got chilled easily, was very argumentative and also hard-headed. He was very smart and went into politics, rising to the head of state. Except for one thing: he never wore any brain protection biking. We all just called him Helmut Cold. I have a pair of stretchy bike shorts that remind me of an old girlfriend who I heard gained alot of weight. They’re expand-ex. A fellow bike rider I knew had a really gorgeous girlfriend named Taye. Because of her beauty, she didn’t have to work to pay for rent and food, since my friend took care of that. But aside from that, she was still pretty broke and was always bumming money for things like bike parts and snacks. One time my friend was out riding with her, and she hit a wet spot in the road. Taye lost control, went off the road and had a bad wreck. Her foot had become stuck in the spokes and the force of the crash had severed a digit. My friend found her pinky toe and picked it up but was grossed out so he let it fall to the ground. 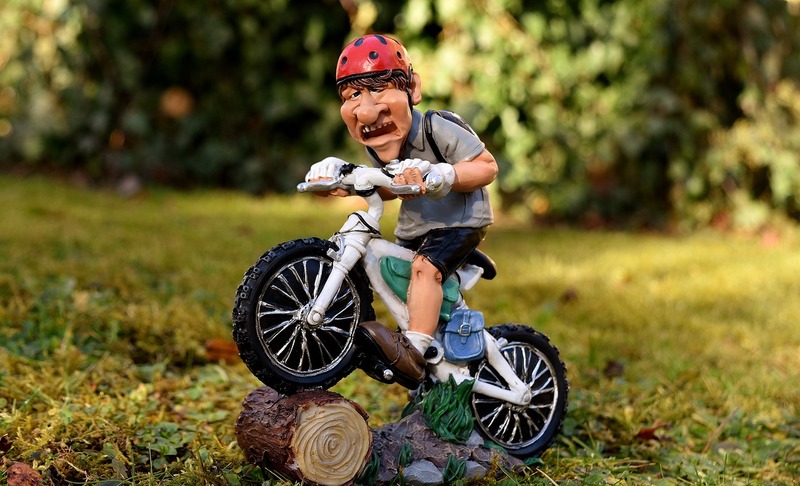 The trauma was all too much for him, so he got back on his bike and raced off. Just a little later on that day, he broke up with her. You could say he dropped her like a hot po’ Taye toe. A group of cyclists that was riding down the road, one behind another. A speeding car came up from behind them on a curvw and forced the bikes off the road. All were ok, but a police detective investigated this bizarre incident. Turns out the driver was involved with an indecent act with a sea bird involving a metal object used to smooth things out, which caused him to lose control of the car and hit the bikers. The cop called it the case of the sin-gull file. There’s a cool business in my town where they make baked goods but also are a place to deposit and withdraw money. Alot of my cycling friends go there after a long bike ride when they’re out of cash plus really exhausted and can’t cycle any farther. They stop by to take out some bread from the bonk. OK, well that was alot harder than you think and I’ve had quite enough. I’m sure you have too. Can you do any better? Let me hear from you if you can, in the comments. Have you been to the Thursday night Driveway races? If you go, say hello to the Tilt team riders. Tell them kudos from Fairhaven, MA. Yes, a few times to observe. I’m no racer and like my collarbones intact. If I make it back I’ll say hi, if they know you by the name Cape John. If you see Tilt I’m know as Brandon’s dad.